A 67 year old Spanish man telephoned a massage shop on Central Pattaya Road to say that he wanted one last massage before he went back to his home country for treatment for a medical condition. When Mr Vincente Fernandez arrived he was taken care of by a massage lady on the second floor of the establishment. Owner Kinpana said that he had been in four or five times for massage before. He had brought some of his own massage cream for the lady to use and was given a 15 minute abdominal massage, reported Sanook. However he went into shock. 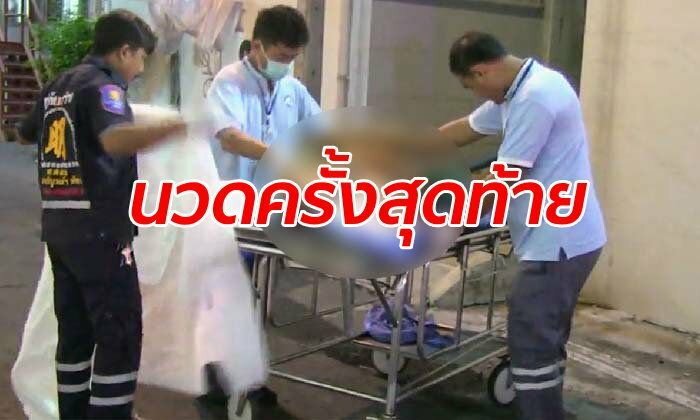 The masseuse rushed down the stairs in a panic and Pattaya Memorial Hospital were called. But Mr Fernandez died before he reached hospital. Sawang Boriboon took the body for an autopsy at the Police Hospital. The massage lady is helping police with their inquiries. A pre-existing medical condition is expected as the cause of death, said the police. Poor spanish guy ..... was the excitement too much for him ? "Sawang Boriboon took the body for an autopsy at the Police Hospital". Doesn't that give you every confidence that a thorough investigation will follow leaving no stone unturned. no no no no not here !! 67 years, a bit early but better this way than suffering for years on some painful condition. Let's assume he was single, no one depending on him. Good timing; and just before he was due to fly home to some, no doubt, miserable existence. I should be so lucky. Knowing my luck, despite a lifetime of drinking and smoking, I'll end my time in some old people's home in Eastbourne talking about the Thai equivalent of what happened in Boggleywalah in '88. Ha! Genetics can be a bu#@er at times, my father's 90 and still going strong. Mother got to 82. At least my pension is CCI linked, wonder what it will be worth in 20 years time. Not that I'll care, having outlived myself - pipe and slippers. Still, having said that, it would be interesting to see how the world turns out. What I can guarantee, given my limited experience of 60 years or so, is it will surprise you. Life is not linear, it is chaotic. what is an abdominal massage ?? There are worse ways to leave this world. But 67 is young still. A good reminder to all of us smoking, boozing, chomping down all fat rich foods..(like me).in other all the fun and enjoyable things of life.... .. it's never to late to change one's habbits, to get into healthier lifestyle patterns for hopefully a longer life. Possibly ruptured abdominal aorta, CVA, Heart failure....RIP.